The Forrestal Grille in Plainsboro is the perfect blend of casual dining in a comfortable environment. 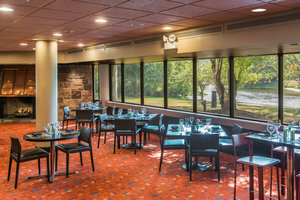 Whether you are snuggled in the bar for an eclectic mix of cocktails and appetizers or dining by the fireplace while overlooking the lake that spans our wooded surroundings, you will enjoy regional American cuisine with an emphasis on fresh local ingredients. While you relax, we will exceed your every expectation. After waking in one of our well-appointed guest rooms, head downstairs to enjoy the Forrestal Grille’s delicious breakfast buffet. Featuring a range of hot entrees each morning, in addition to cereals, meats, cheeses, coffee and tea, our breakfast is the perfect way to start the day. In addition to our buffet, guests can choose from our delicious a la carte menu options! Breakfast is served each morning from 6 AM-11 AM. Later in the day, visit the Forrestal Grille to enjoy a delicious a la carte lunch or dinner. Featuring a range of classic American dishes, our restaurant is the perfect place to enjoy a delicious meal while mingling with colleagues after a conference. Enjoy weekly happy hour specials, served daily from 4PM- 7PM. Feeling hungry after a long day? Order from Forrestal Grille’s room service menu! Operating daily until 11 PM, guests can curl up in one of our hotel’s cozy beds while enjoying one of their favorite meals from downstairs. After dinner, head over the Flight Martini and Wine Bar to enjoy creative cocktails and intriguing drink specials throughout the week! 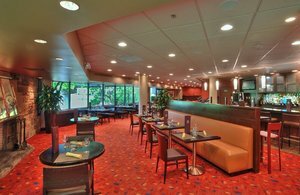 Book your stay at the Crowne Plaza Princeton Hotel and Conference Center today to enjoy a delicious dining experience without ever leaving the hotel at the Forrestal Grille in Plainsboro!